Jerry Horne wrote: Ross - I've always heard that the still was of Annie in a phone booth. However it seems to be Annie talking on the pay phone at the RR. Ahhh... So its not part of the Norma scene after all. Might it just be a publicity shot? - At the diner, Norma asks James about Nadine. Hank mistakes Tojamura for Jonathan and pushes his face into a plate of food. - Norma argues with her mother, while Hank and Ernie plan their “hunting” trip. - At the RR, Cooper & Truman talk about his defense. Cooper tries to cheer up Norma about bad review. - Josie(’s double) in the Red Room. So we can assume those scenes were filmed. So what all do we know were actually filmed? Ross wrote: So what all do we know were actually filmed? The only one on this list that I seem to remember for sure wasn't filmed is the one of Leland dancing with his secretary in episode 4. Didn't Lesli Linka Glatter say she was going to play that role, and she had the costume and everything, but they decided at the last minute not to film it? I think that was at the USC thing. I wouldn't be surprised if some of the missing scripted scenes in the David Lynch episodes weren't filmed. So many of the scripted scenes in his episodes seem to change considerably from what was on the page and there are so many stories of him changing things on the spot if he felt like it. But another thing at the USC panel last year -- didn't Harley Peyton or David Patrick Kelly or somebody say that David wanted his episode #2 to be two hours long because he shot so much footage for it and didn't want to have to cut it down? I added EXISTS to all the scenes I know about. I'm probably forgetting some and don't know about others. - Before picking up Donna, Bobby & Mike buy beer and plan to look for James. – At the Packard home, Truman and Cooper discuss Andrew Packard's death. – Cooper says goodnight to Truman, and introduces himself to Ben Horne at the hotel. 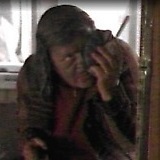 – Norma sees a gun in Shelly’s purse. – Beginning of scene with Cooper & Truman arriving at Leo’s. Truman is worried about repercussions from hitting Albert. – Leland watches an additional “Invitation to Love” scene before Maddy arrives. – At the Roadhouse, Truman orders surveillance of Jacques. – Caretaker at the cemetery asks Cooper if he can hear the coffins. - At the Great Northern, Ben gets an update on the Icelanders on the phone with Jerry. A distraught Leland dances with a secretary and the photo of Laura & Audrey from Ben’s desk. - James and Big Ed talk about James' mother and her drinking problem. – Cooper and company prepare to enter the woods to search for Jacques’ cabin. – Major Briggs talks to the Icelanders about nature, beliefs, folklore, and UFOs. – Josie arrives at the Great Northern reception and briefly talks to Pete. – Ben’s office, Ben introduces Einer to Catherine. Catherine & Ben discuss burning the mill. – An unidentified figure watches Donna, Maddy, & Eileen through the window. – Asian man watches Cooper walk through Great Northern dining room. - Ambulance outside burnt mill: Truman asks Pete about Catherine, Hawk says Josie is missing, Andy tells of calling Cooper’s room. - Truman visits Shelly at the hospital to tell her Leo's been shot, Truman visits Ed & Nadine’s room. - At the RR, Hank pretends to care about Shelly, discusses getting flowers for her. - At One-Eyed Jack's, Audrey talks with Nancy about Laura and Ronette. - Cooper and Truman talk to Doc Hayward at hospital coffee bar. Ask why Bobby is there. - At One-Eyed Jack's, Nancy tells Audrey about the mill fire. - Cooper/Truman/Albert at the Blue Pine. Pete punches Albert. - At the RR, Leland and Maddy get malts. She talks about her father. Hank tells Norma he is buying her a car. - Ben meets with Truman about Audrey being missing. - James & his mom scene (cut for 2nd time, but not re-shot). - At the Hayward’s, Doc calls Ed about Nadine’s condition and a probable cause. Then he argues with Donna about missing days at school. - Cooper & company at Harold’s place. Gerard is asked if Bob has been there. - Cooper discusses Laura's secret diary and Harold Smith's blood type. - At the RR, Hank tells Ernie of One-Eyed Jacks. Norma tells her mother she thinks the men are up to something. - Donna promts Doc Hayward to tell her that Maddy has been killed by the same killer. - Cooper tells Diane about Brigg’s disappearance and talks of Earle (before Milford wedding). - Eckhardt tells Jones to “finish the job”. - Truman arrives at the Great Northern and calls Cooper’s room. The line is busy. - Wheeler & Tim and Tom's Taxidermy. Donna promts Doc Hayward to tell her that Maddy has been killed by the same killer. The show needed more scenes with people talking about Maddy after her death. They missed a big opportunity there. Josie(’s double) in the Red Room. At One-Eyed Jack's, Audrey talks with Nancy about Laura and Ronette. and At One-Eyed Jack's, Nancy tells Audrey about the mill fire. These two strike me as the most intriguing on the list, in that they would have added some dimension to the Nancy character, giving us a reason to care about her by tying her and the S2 One-Eyed Jack's plot into the Laura Palmer narrative, the show's golden goose. I also would have liked seeing more of Audrey - one thing that is unfortunate about early Season 2 (which I mostly love) is the way that Audrey's character loses agency and just becomes a damsel in distress in a heroin daze. It would have been good to see more of her investigation at Jack's, making us more invested in her taking the big risk to be there undercover. So, apparently Johnny's nurse from the Pilot and Episode 1 is named "Greta" (according to IMDB at least). I could not find any source for it (episodes, credits, novels, online interviews or scripts. I never could find an episode 7 script copy and I also don't have the WIP magazines, though). I have been told on this forum that it actually probably was from a deleted scene, but it is not in the ones I saw from the official boxsets. Does it ring any bell ?